Erin Gates is a real estate junkie. Several years ago, the Newton-based designer, blogger, and author fell hard for a house in Concord. She and her husband had been exploring the area, imagining a calmer country life, when she saw it. “I nearly did a tuck-and-roll out of the moving vehicle,” she recalls. Gates didn’t buy the house, but a few months later, the home’s new owner e-mailed her inquiring about interior design services. 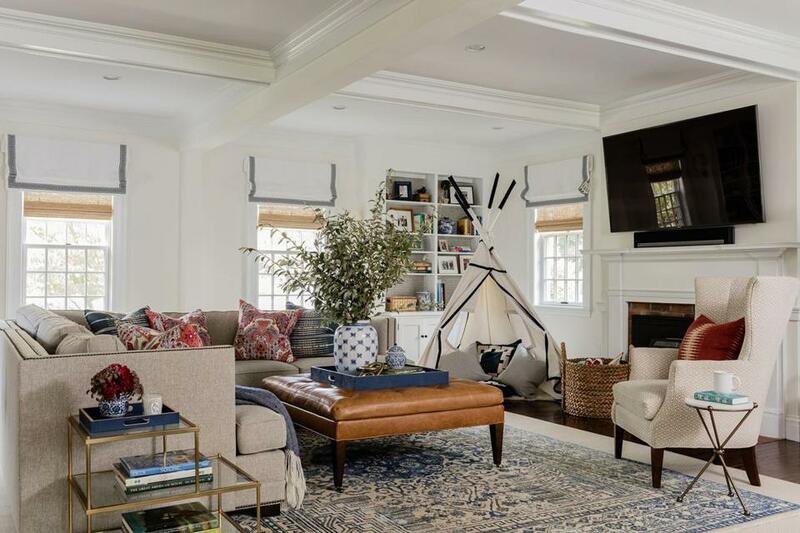 The clients, first-time homeowners and young parents, asked Gates to furnish the five-bedroom house, which had been renovated before hitting the market. They wanted it to be comfortable yet tailored, to reflect their classic taste. Gates, whose second book, Elements of Family Style: Elegant Spaces for Everyday Life, hits stores April 2, jumped at the opportunity. The family uses the mudroom off the garage, but guests enter through a foyer in the original portion of the Cape-style house, which was built in 1933 and later expanded. Taking cues from the barrel ceiling and old-fashioned hardware on the door, Gates mixed antique furniture and vintage rugs with wallpaper in a funky oversize pattern. “The wife absolutely loves wallpaper,” she says. 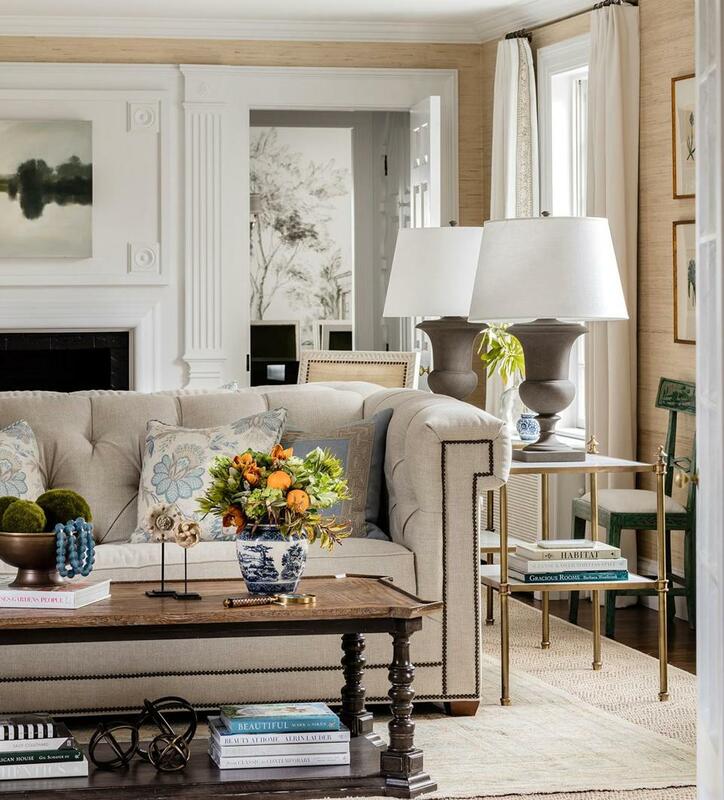 This cozy corner of the living room is one of designer Erin Gates’s favorite spots in the house. The scheme gives a taste of what’s to come. “They’re young but very rooted in traditional design, so we weren’t going to do anything crazy,” Gates says. 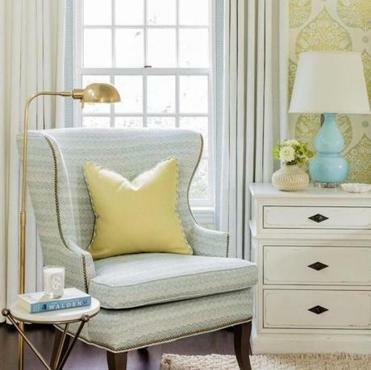 She used a light, airy palette in the formal rooms. “I wanted it to feel soothing,” she says of the living room. 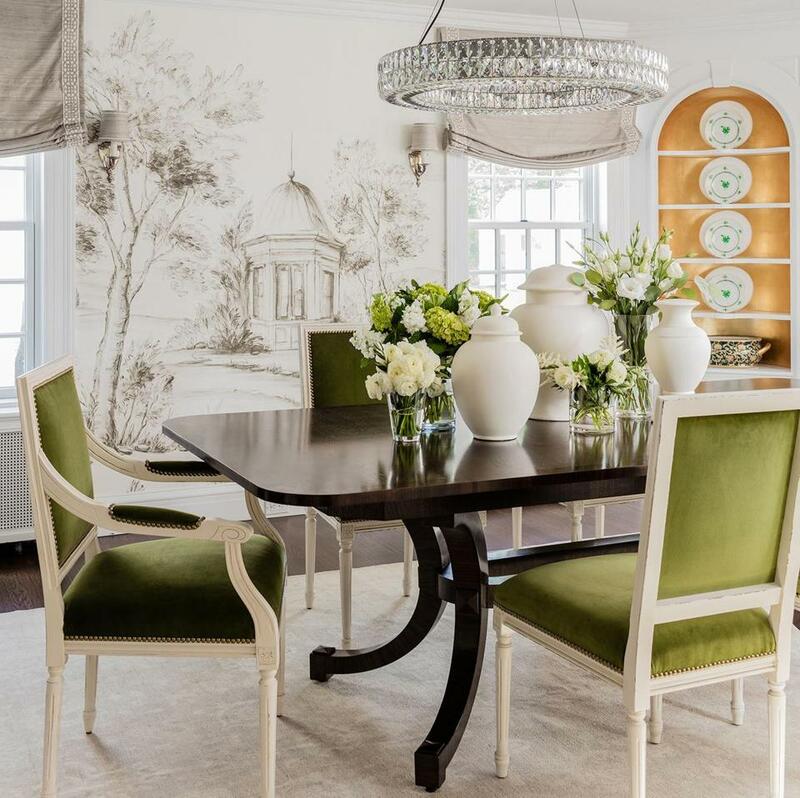 “It’s important that parents have a retreat where they can enjoy a glass of wine together.” Grass-cloth wallcovering warms the long, narrow space, in which she positioned a pair of tailored but cushy sofas back-to-back to create two seating areas. One faces the fireplace, the other built-in bookshelves lined with wallpaper in a pattern inspired by Florentine endpapers. “Everything looks great against it,” Gates says. From splurging on drapes to layering rugs, insider tips from the Newton designer behind the Elements of Style blog. 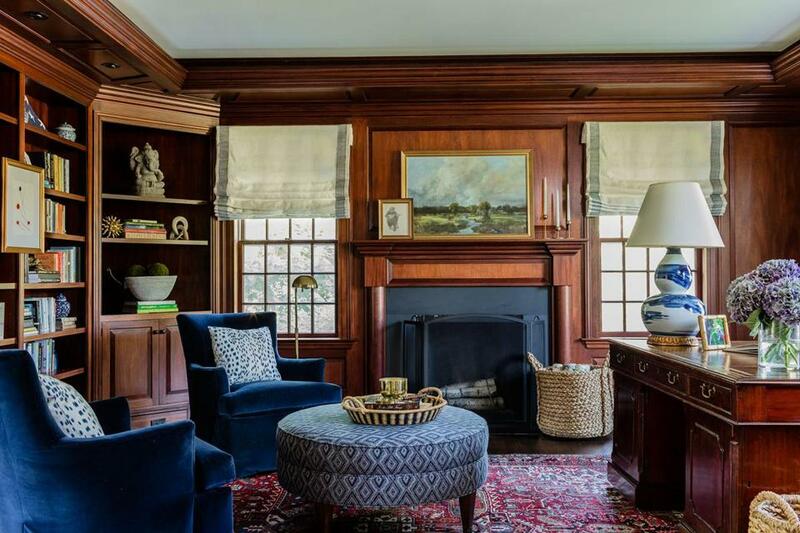 French doors lead to the wood-paneled study, grounded with a richly patterned Persian rug and amped up with royal blue velvet swivel chairs. The antique partners desk was a client request. The wife, who is the daughter of two lawyers-turned-writers, loves a substantial work surface and often collaborates with colleagues here. In the family room, the Keaton sofa from Mitchell Gold + Bob Williams is upholstered in an outdoor fabric and holds pillows in global-influenced patterns. In the family room, where the homeowners spend most of their time, the scheme is equal parts comfortable and tailored. Gates replaced the existing sofa with a clean-lined sectional and a leggy leather ottoman. “They serve their purpose and look good doing it,” she says. The blues and reds from the study make an appearance on this end of the house, punching up the neutral backdrop. The husband lobbied for color, specifically for red, a challenge Gates says she enjoyed because it took her out of her comfort zone. She spruced up the casual eating area that sits just beyond a half wall of toy-filled shelving by hanging a linear lantern with an aged iron finish over the existing farm table. On the new gallery wall, small artwork mixes with tokens from family travels. “I love working with people’s memories,” Gates says. The designer worked magic in the guest bedrooms and master suite. Strategic applications of color, pattern, and texture using wallpaper, rugs, custom pillows, and other small pieces supplement the couple’s early bed and dresser purchases — matching sets that posed a challenge. Between the beds from Room & Board in the son’s bedroom is a photo of a baby giraffe from The Animal Print Shop by Sharon Montrose. The kids’ bedrooms — the couple’s son is now 4, and they have a 14-month-old daughter — were a place to get a little whimsical. 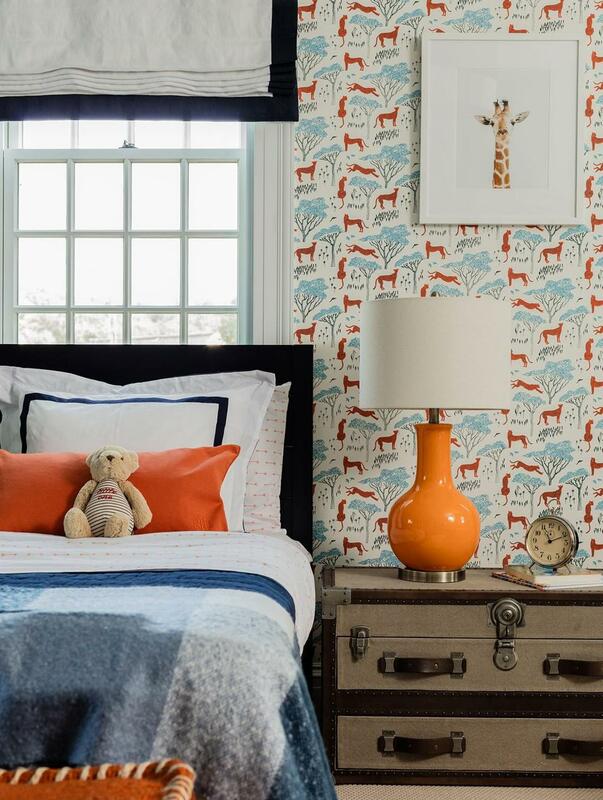 Honoring the husband’s penchant for retro Wes Anderson flavor, Gates used Hygge & West Serengeti wallpaper with orange cheetahs, which the little boy says good night to at bedtime. A Moroccan-style rug, kilim poufs, and a steamer trunk nightstand round out the explorer theme. Meanwhile, dreamy pink mural wallpaper the mom spotted before she was even pregnant decorates the nursery. 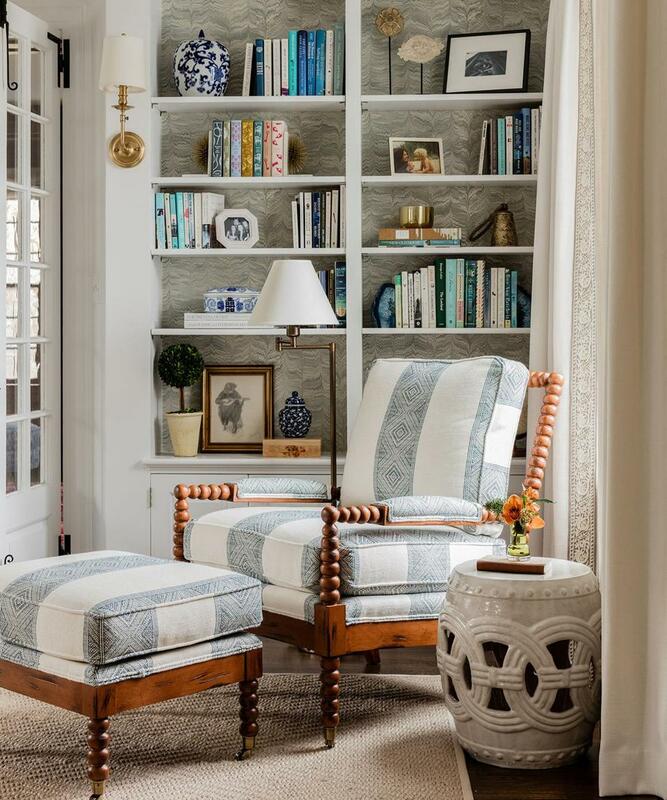 A landscape painting by Bethanne Cople, from Huff Harrington in Atlanta, hangs above the fireplace in the study, and a ceramic lamp with a brushstroke pattern by Bunny Williams Home brightens the desk. Gates added the Darlana lantern by Visual Comfort and created a gallery wall in the eating area adjacent to the family room. The Hua Trees mural wallpaper by Sian Zeng covers two walls in the nursery. Aside from the antique brass finished iron crib from RH Baby & Child, “Nothing is very juvenile, so she can keep it forever or repurpose elsewhere,” says Gates. The Colefax and Fowler Casimir pillow fabric was the jumping-off point in the living room. The sofa is upholstered in family-friendly Schumacher performance linen. Marni Elyse Katz is a frequent contributor to the Globe Magazine. Send comments to magazine@globe.com.